Before your license can be activated, your purchase order must be received by our accounting department. Completed purchase orders may be faxed to our US office at 412-681-4384 or you may e-mail a scanned copy to us.sales@grapecity.com. 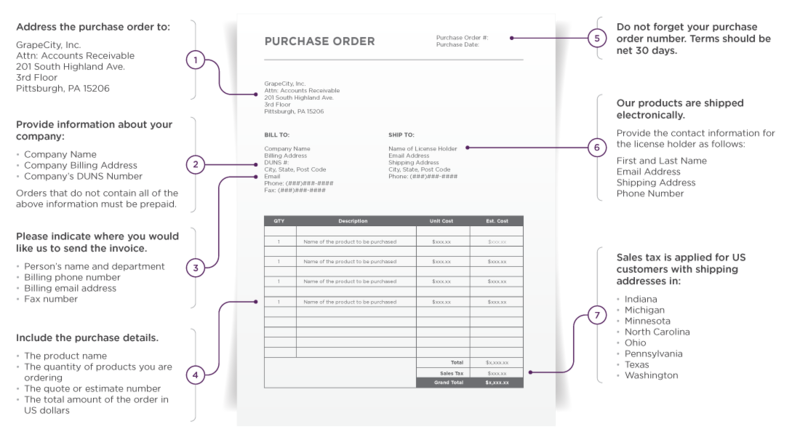 Purchase orders are typically processed within one to two business day from that date in which it was received. All GrapeCity, Inc. terms and conditions apply, which may be altered at any time without notice. In the event that payment is not received within the period of time specified on the invoice, (i.e. NET 30) action will be taken to immediately deactivate any product licenses and accounts for your company. The payment methods we accept to settle purchase orders are Bank Wire Transfer or Check. You will find our banking details on the invoice which will list the appropriate routing number, name of bank, address of the bank and other beneficiary information. Most banks charge fees for sending and/or receiving wire transfers, these fees are not included in the list price of GrapeCity’s products; therefore, all associated fees are the responsibility of your company. All sales of licenses and/or services by GrapeCity are governed by the terms of GrapeCity’s End User License Agreement (EULA) and/or any written amendment thereof as agreed upon by the parties. All terms and conditions proposed by buyers which are different from or in addition to the terms and conditions proposed by GrapeCity’s EULA are unacceptable to GrapeCity, are expressly rejected by GrapeCity, and shall not become enforceable or binding, in any way, on GrapeCity. Any modification and/or addition to the terms of the EULA shall only be made in writing with full disclosure and the express agreement of the parties.